The Dutch producer and composer Hans van Hemert wanted to record a medley of wellknown hits. He needed a group, found three models, Iris Wolkenstein, Gaby and Angie Kreutz with their friend Manfred Köhler and called them Veronica Unlimited, after the popular Dutch broadcasting organisation. Their first single 'What kind of dance is this' was a big hit in several countries. 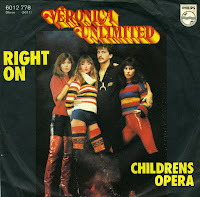 This single, 'Right on', was its follow-up. Although less successful, it still managed to reach number 30 in the Dutch Top 40 in January 1978. The B-side is particularly amusing if you want to hear four Germans sing a medley of Dutch children's songs. The pronunciation of 'papier' ('paper'), which is a word both in German and Dutch is unmistakably German. Producer Hans van Hemert formed Veronica Unlimited on the occasion of the 12,5 year jubilee of the Dutch broadcaster Veronica's Dutch Top 40. 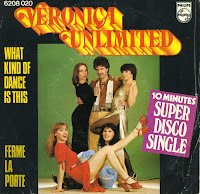 His idea to make a disco medley of old hits, combined with jingles from Radio Veronica, was realised by singers such as Margriet Eshuijs and Sandra Reemer, although the line-up soon changed to include four German singers: Manfred Kohler, Edna Bejarano, Gabi Kreutz and Angie Kreutz. 'What kind of dance is this' was the group's first single and also their biggest hit. It reached number 2 in the Dutch Top 40 in the summer of 1977. The B-side of this single features a disco version of the classic melody 'Für Elise'. Subsequent releases couldn't match this success, and ultimately the group broke up in 1981.